Miami, Florida has a lot to see and do but if you’re looking for a quirky, mysterious and world famous attraction, be sure to visit the Coral Castle Museum. Its art, architecture and myth have been the subject of news stories, magazine articles and television shows. The story starts in Latvia where 26 year old Edward Leedskalnin fell in love and proposed marriage to 16 year old Agnes Scuffs. He called her his Sweet Sixteen. Agnes accepted Ed’s proposal at first but changed her mind on the night before their wedding. Ed was heartbroken. Ed left Latvia and traveled Canada, California, and Texas until he developed tuberculosis and moved to Florida in 1918 for his health. In Florida, he decided to create a monument to his lost love, his Sweet Sixteen, Agnes. For 28 years, Ed secretly turned huge pieces of coral into a walled monument to Agnes. The coral walls are eight feet tall, four feet wide, three feet thick and each section weighs more than 58 tons. Ed carved more than 1000 tons of stone and coral into castle walls, a two-story tower, obelisks, tables, chairs, thrones, doors, lounges, crescent moons and an eight ton revolving door that could be turned with the push of a single finger. What’s even more astonishing is that no one knows how he did it! Some people claimed that he used magnetic secrets to levitate tons of coral and stone. Others claimed he had the help of space aliens or that he used magic. Television shows such as In Search Of and That’s Incredible featured Ed’s mysterious creation. The History Channel’s Ancient Aliens offered an out of this world look at Coral Castle. Two-time Grammy nominated rocker Billy Idol wrote and recorded his song “Sweet Sixteen” as a tribute to Ed. The video was actually shot on location at Coral Castle. No matter what you choose to believe about Ed Leedskalnin and the Coral Castle, this unique story has caught the attention of the world. 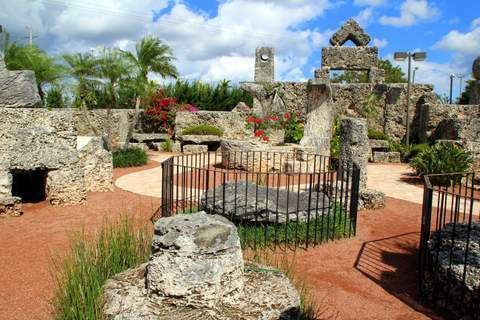 The Coral Castle Museum is located at 28655 South Dixie Highway, Miami, Florida.